Looking to get your Instagram verified? Getting Instagram verified symbol is one of the most discussed questions about the platform. The question is almost as discussed and asked as much as the question of how you grow Instagram followers. That’s because having an Instagram verified symbol comes with the same prestige as having a lot of followers. Apart from what many tend to believe, the Instagram verified symbol has nothing to do with follower count. Sure, there might be a correlation between the number of Instagram verified symbols that there are in total and the number of those belong to accounts with huge followings. However, while the relation might be correlated, it isn’t due to causality. I’ll get more into detail of this further on. That you don’t need a lot of followers is great news for most of you since not everyone has the same amount of followers as Taylor Swift or Kim Kardashian. In this post, you’ll learn everything you need to know about the Instagram verified symbol, how getting verified on Instagram work, and what you can do to increase your chances. The blue tick marks are used across various social media platforms indicating that they are the verified accounts of famous personalities or celebrities. 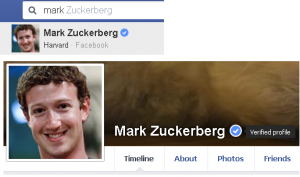 In other words, verification symbols for famous personalities can be found on Facebook, Twitter, and several other platforms. The idea of them, however, is universal, no matter which platform they’re used. On Instagram, the verified badge is very mythical. First off, Instagram is quite restricted to revealing any details, and they don’t have an obvious application process for it. This could lead us to think that all we need to create an account and wait for the Instagram verified symbol to appear from the sky. Unfortunately, that’s not quite how it works. Because that would leave you sitting and waiting for a long, long time. Here’s something that shocks a lot of people: the Instagram verified symbol isn’t restricted to a lucky few. The catch, however, is that in order to get Instagram verified, your account needs to meet a number of different criteria, and it needs to have certain characteristics to even qualify for the Instagram verified symbol. While you don’t have a lot of power of Instagram’s iron fist which chooses who gets verified, what you have power over is the characteristics that your account has, and this is why working to get the Instagram verified symbol is all about increasing and working on the characteristics that make an account qualify for the verified badge. The bottom line is that the Instagram verified badge is limited to a selected few, The good answer is that if you have an Instagram account with the right characteristics you can very well become Instagram verified. Let’s begin doing some detective work in order to understand the Instagram verified badge a little bit better. Essentially, what this text says is that an Instagram verified badge has the purpose of showing that an account is the authentic and official account for the public figure, celebrity, or global brand it represents. This actually gives us something to go. 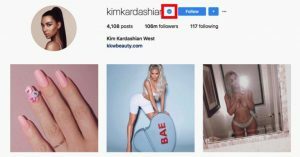 As Instagram reveals, in order to get an Instagram verified badge, you need to be one of the following: a public figure, a celebrity, a global brand. As such, when working to get the Instagram verified badge, you want to work to establish your role as one of the three in your own industry. Instagram says there are no ways to request a verified badge, but instead recommend using other methods to show that your account is the real deal. This includes doing things like linking to your Instagram profile, Facebook page, or other social accounts of yours. Now, let’s dig into the interesting stuff of how you can work actively to increase your chances of getting the badge. As mentioned, having lots of followers isn’t causality of getting the Instagram verified badge. Instead, having lots of followers and the verified badge is a correlation, and just having a lot of followers does not, in theory, have to mean anything for getting the Instagram verified badge. Instead, it is what having a lot of followers on Instagram resembles and means that leads to getting the Instagram verified badge. It’s easy to look at all the top accounts that have verified badges, who are A-list celebrities and draw the conclusion that in order to get Instagram verified, you need to have a ton of followers. That, however, is not the case. Yes, it is true that most accounts on Instagram that have the verified badge are accounts that have millions of millions of followers, but it’s actually not the number itself that affect whether or not you get verified. While the majority of verified Instagram accounts have millions and millions of followers, there are quite a few small accounts that are verified as well. Just look at the Instagram account belonging to Dante Jones. It has a bit more than 5K followers, and no posts uploaded. If you’ve been living with the idea that having a lot of followers on Instagram is the key to getting Instagram verified, this is very confusing, to say the least. This is really the foundation to why the Instagram verified badge exists in the first place. And when you understand the context of something, it’s easier to adapt to it, and in this case, increase the chances of getting verified. Again, tying this together with having a lot of followers. The reason why there are Instagram verified badges is so that the impersonators and replicators can be easily distinguished from the real deal, and many times, having a lot of followers means having a greater fame. As such, you run a higher risk of being impersonated. Can you spot the fake from the real? The whole reason to why Instagram has the verified badges is so people will be able to find the real profile and ignore the impersonators. If you are a person that have a lot of “fake profiles” in your name, then you might have a chance of getting a verified badge, especially if you express your concern to Instagram. Instagram wants to make it easy for its users to easily find the real person and not have anyone fall for a fake Instagram account. 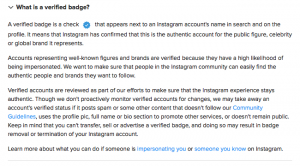 Instagram wants to encourage active users and if they come to your profile to see if you meet the requirements to get certified and see that you haven’t been posting in a month, then you probably won’t be receiving a verified badge. At least not if you barely meet the other criteria for getting verified. Firstly, if you are inactive, they might think that you have quit Instagram. And what’s the purpose of making a person that doesn’t even use the platform verified? And secondly, Instagram want their users to share things with their audience often. Instagram want active, fun users and giving an Instagram certification badge might encourage that, and show people that if you’re active and contributing to the platform, you might be rewarded with a verification badge. This one is pretty obvious but very important well if you want to get your Instagram verified. Instagram wants a friendly platform without negativity and hate, and if you recognize yourself in this, you better knock it off. If you want Instagram to verify you, you better not make them angry. We all know that hate on social media is a big issue and if you are one of those that are spreading it – NOT GOOD. 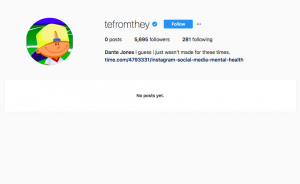 Another way for Instagram to see if you have been behaving on their platform is to see how many times you have been reported and made people upset. As a big influencer with many followers, it is hard to please everyone, but it’s obvious when it’s your fault and when you just have haters. It has been reported that employees at Instagram actually charge for verifying people. If you know someone on Instagram or know a third party who knows someone on Instagram, and you’re willing to pay, this might be a way to get Instagram verified. Obviously, Instagram is working hard to prevent this as having employees sell verified badges kind of ruins the whole point of having the verified badges. If you are to follow the steps here to increase your chances of getting verified, I’m not going to lie and say that it isn’t going to mean a lot of work. This is why some people prefer to buy the verified badge, even if it can cost them several hundred dollars. It’s a lot easier to buy it than working to increase your Instagram fame and establishing your presence on the platform. Plus, even if you put in the work, you never actually know if you’ll ever get the Instagram verified badge. Can you apply to get verified on Instagram? If you are to trust the words of Instagram, there isn’t a way to apply for the Instagram verified badge. If Instagram feels like you’re fulfilling all of the criteria above, there’s a chance that they’ll verify your account, however, there is no guarantee. There are tons of accounts that all match the criteria above for getting a verified Instagram badge but still aren’t Instagram verified, so in a way, it’s partly about luck and being at the right place at the right time. 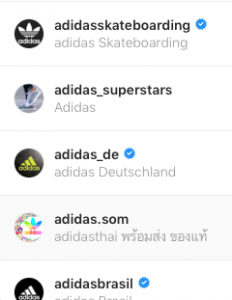 The catch is that Instagram answers the question ”Can I request a verified badge for my profile?” with ”It’s not currently possible to request or purchase a verified badge”, the only catch is that it is possible to request a verified badge. If you work with a digital agency, you can have them submit a request for being Instagram verified, but maybe what Instagram means is that just anyone can’t request the Instagram verified badge. This is because the digital agencies have contacts and a way into Instagram that the normal people don’t have, which doesn’t guarantee that each of the accounts they Instagram to verify will get verified, but they will at least get the opportunity to ask. Of course, having a digital agency ask to get your Instagram verified doesn’t guarantee anything, and they might have to ask time and time over until you actually become verified. Safe to say, it’s quite a complicated process. Can you buy the verified badge on Instagram? While money solves a lot of things, it doesn’t solve your issue with not having an Instagram verified badge… Or does it? At least for the moment, it isn’t possible to buy a verified badge on Instagram, and chances are, you won’t be able to buy the verified badge on Instagram in the future, either. 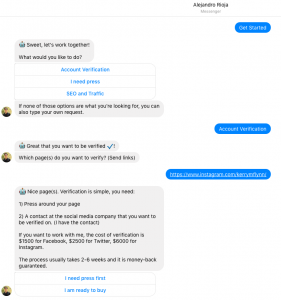 But as mentioned, if you are willing to pay a few hundred dollars up to several thousand dollars and have contacts inside of Instagram, they might be able to get you the verified badge, but as mentioned, there are no guarantees. There are at least no official ways to buy the Instagram verified badge. These were some of the most important demands that you have to follow if you are looking to get a blue tick on Instagram. We hope that you have learned How To Get Your Instagram Verified, after this article. Good luck with your Instagram verified badge! The most common question that people ask is how many followers you need on Instagram to be verified, but the thing is, getting the Verified Instagram badge is not about follower count. There are accounts with only a few thousand followers on Instagram that have the Instagram verified logo on their profile, and there are accounts that have millions of followers that are verified. What is true though, is that if you have more followers, you are more likely to be replicated, plus, the accounts that have lot of followers that belong to individuals and brands that are often being replicated. This is the reason to why the vast majority of accounts on Instagram that have the Verified Instagram badge also have lots of followers. It’s a correlation, but it’s not necessarily a causation. Getting an Instagram verified badge is quite tricky but not impossible. With either hard work or the right contacts, you can get Instagram verified. The problem, however, is that there are no guarantees. NextHow Do You Get Instagram Insights? so…. how do you do it. I have 12 k followers and I´m not verified. I have from 2012 my account, working on it to gain followers and no body helps me to be verified. ( we can´t ask for it ) …. Hope one day I will have the tick.